If your idea of a good holiday is a holiday away from the hordes, the untouched scenic beauty of the 5.6 km long Agatti Island in the Union territory (UT) of Lakshadweep is a pretty safe bet. Perfect for those seeking peace and relaxation, Agatti Island, in many ways, is still a land of unknowns. Located on a coral atoll Agatti Island offers the warmth of the tropical sun to nature lovers who come here to walk for miles amidst the stunning natural landscape. Covered with lush green palm trees, Agatti Island basks under the glorious Arabian sun and contains breathtaking setting, uncrowded and unspoilt. One of India’s best-kept secrets, Agatti Island, 459 km from Kochi in Kerala, offers picture perfect locales to the tourists in the form of silvery beaches, brilliant coral reefs and turquoise blue lagoons besides the warm hospitality of the locals. With its myriad hues of crystal clear azure waters, Agatti Island is a favourite haunt for waterbabies of every age group. Some of the water sports activities that visitors can indulge in when they make a trip to the Agatti Island are sailing, kayaking, fishing, snorkeling, scuba diving, lagoon cruising, glass bottomed boat riding and water skiing. Enjoying water sports are the best way of spending your vacation in the beautiful Agatti Island where you will have an unforgettable time. A couple of resorts at the island offer a good number of water sports activities. While at Agatti Island, you can visit the neighboring uninhabited islands of Kalpitty, Bangaram and Parali. Kalpitty is a small island encircled by a clear water lagoon. 7 km away from Agatti, Bangaram is the nearest island. 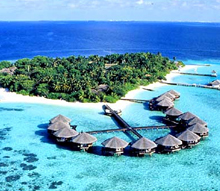 The only airport in the union territory of Lakshadweep is located at Agatti Island which is connected to Kochi by flights. Kochi and Agatti Island are also connected by sea.